A brief review of the many, many posts we've done here about the DMCA and its notice and takedown platform will reveal to even the casual reader that the whole thing is rife with complications, abuse, and inconsistencies. It can be a difficult realm to navigate, but there are times when an entity's claims of ignorance just don't ring true. Which brings us to one independent Ford dealership that decided to simply yoink an image from a relatively new video game and use it to advertise automobiles. 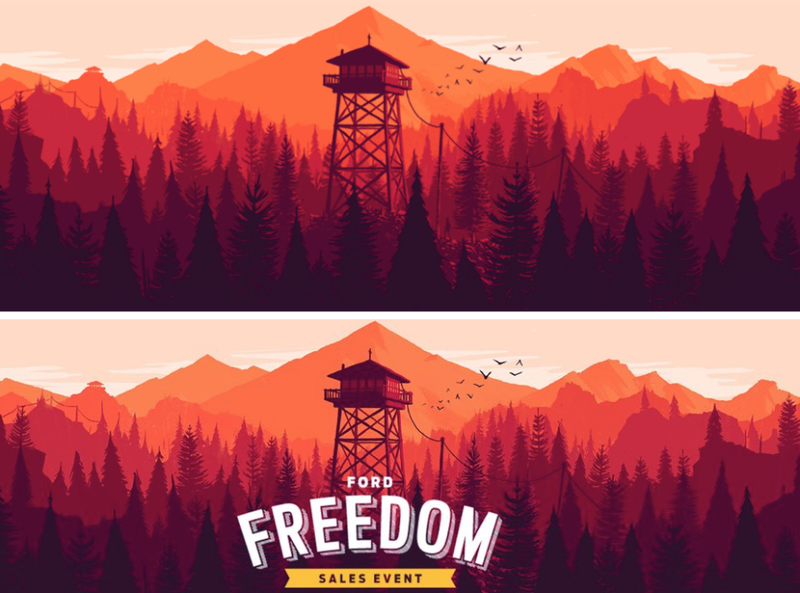 A Boston-area Ford dealership is dealing with some internet blowback this afternoon after folks realized that the car-seller had swiped artwork from the indie game Firewatch to promote the “Ford Freedom” sales event. The Consumerist link then provides a side by side comparison of the image from the game and the ad that the Ford dealership put out. As you will see, there wasn't even the barest attempt made to obscure the original image in any way. So, yeah, they pretty much took an image from the game and slapped some copy on the front and pushed it out to potential car-buyers. That's pretty much as infringe-y as copyright infringement gets. And the use of the image is even somewhat ironic, given that Firewatch is a game that tasks you with traversing the wilderness entirely on foot and this is an ad for a car dealership. The media began contacting Ford once folks on Twitter alerted the makers of the game to what the dealership had done. Ford washed its hands of the whole thing, stating that the dealership acted as an independent entity. The dealership, when contacted, pushed the calls off onto the dealership's advertising department. The advertising department just flat hung up on some inquirers, before emailing out its, um, "explanation." The ad exec then wrote back to say clarify that “We always use DMCA compliant sites when getting images,” referring to the Digital Millennium Copyright Act. The ad guy claimed that the Firewatch image was obtained from a DMCA-compliant digital “wallpaper” site, but he seems to be confused about complying with the DMCA actually means. Very confused, because obtaining an image from a site that complies with the DMCA doesn't suddenly make those images royalty-free, free to use in commerce, or even non-infringing themselves. All it means is that the site would comply with the notice and takedown procedure once alerted to an infringing work on its site. If no notice happens, the takedown might not happen either, which doesn't in any way render the image non-infringing. The fact that we don't hear of this kind of thing happening more often is likely an indication that the actual rules within the DMCA and how copyrighted images can and can't be used in commercial ad copy is within the lexicon of most companies' advertising departments. This particular Ford dealership might want to give HR a call and get the ball rolling on some staff turnover.